Before Shot —- lots of brownie like sludge..
Last night I removed the oil pan last night and today I cleaned and painted the pan.Let’s talk a little about removing the pan. It wasn’t so bad. I did a few things to make the job easier. I set up a small jack with a big piece of packaging foam to “prop up” the pan so it wouldn’t drop. This worked really well. I didn’t want to bend the pan under its own weight when the bolts were down to the last few. 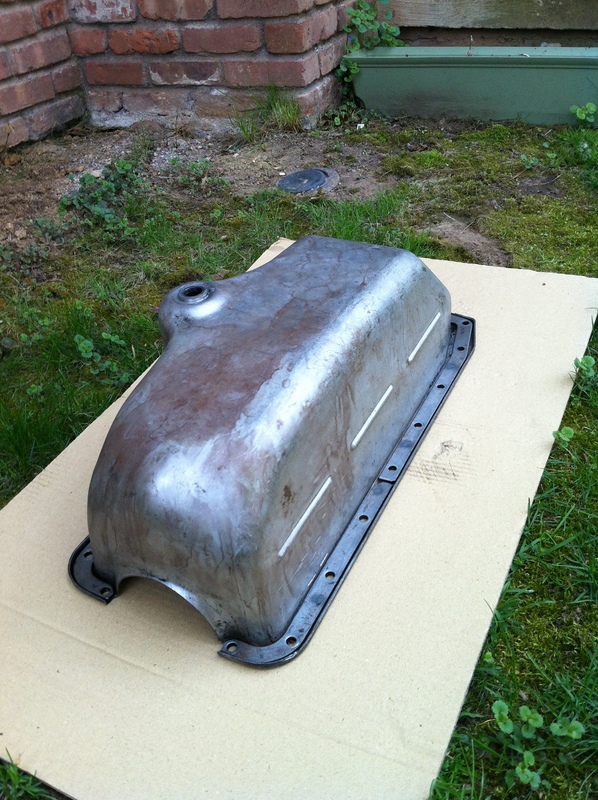 The added benefit was that I could lower the pan SLOWLY and remove the oil pump without it falling into the pan. I was also given the “hint” to turn the wheel all the way to the right or left so the tie rod would move out of the way. If I didn’t do this, I wouldn’t have been able to remove the bolts in the front of the pan. Cleaning and prepping the pan was a whole other story. This took nearly all day. 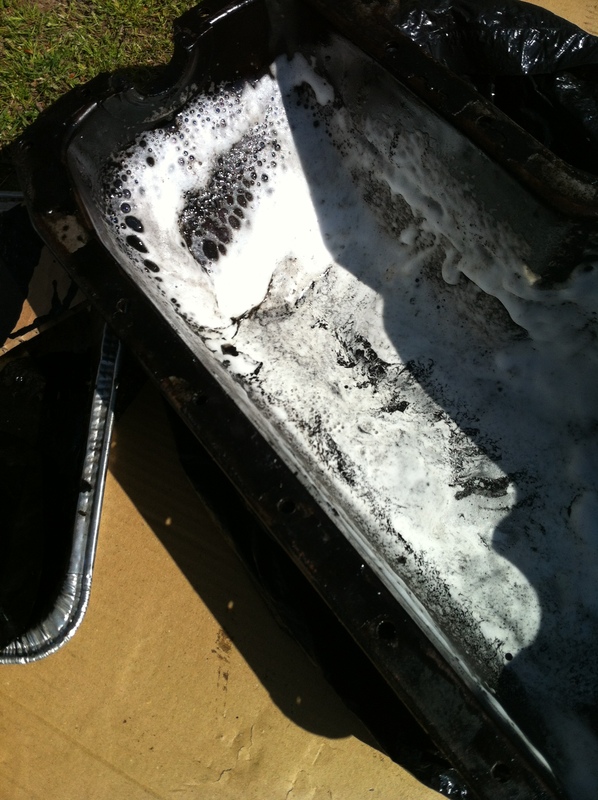 First I let the pan drain a little into an aluminum tray. After clearing off the baffles, I wanted to remove the baffles. This wasn’t easy. There are two methods that seem to work for people. The first is to put the pan in a heavy plastic bag and SLAM it into the ground a few times. I tried this second… it didn’t work. It did wake a neighbor. The method that I started and ended with was using a lever in the hole and using my foot to expand the pan. This method isn’t as “easy” as folks claim. It took time. It eventually worked. 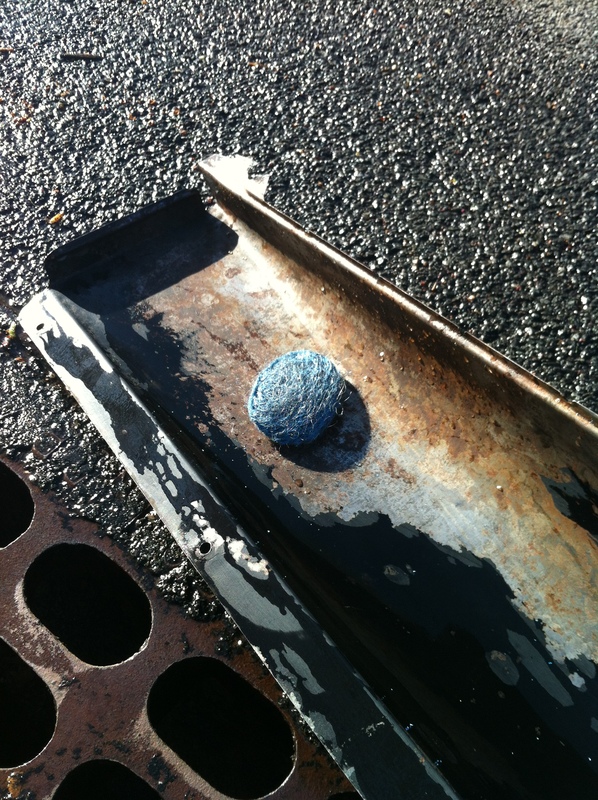 Then I scooped out the crud/sludge with cardboard and a scraper. I found TWO unused cotter pins — one was in the baffle the other was in the bottom of the pan. The amount of sludge was less than expected and there was no sign of any pieces of metal. This was great news. 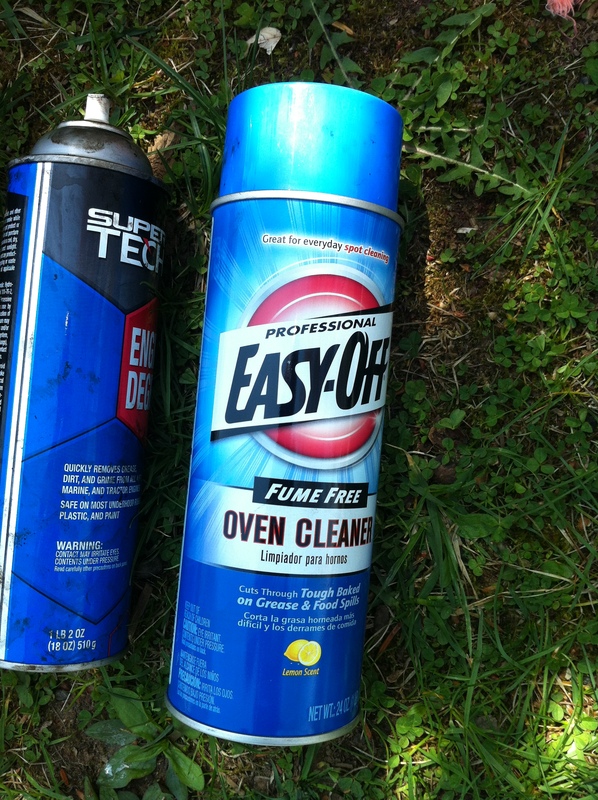 Oven Off outperformed the engine degreaser. Elbow grease was greatly required. I also used about 15 SOS pads. Cleaning the pan also revealed a surprise. Something that I thought was soft/spongy anti-rattle stripping where you bolt the underside of the pan was actually steel reinforcements under layers of sludge. I was shocked to see this. 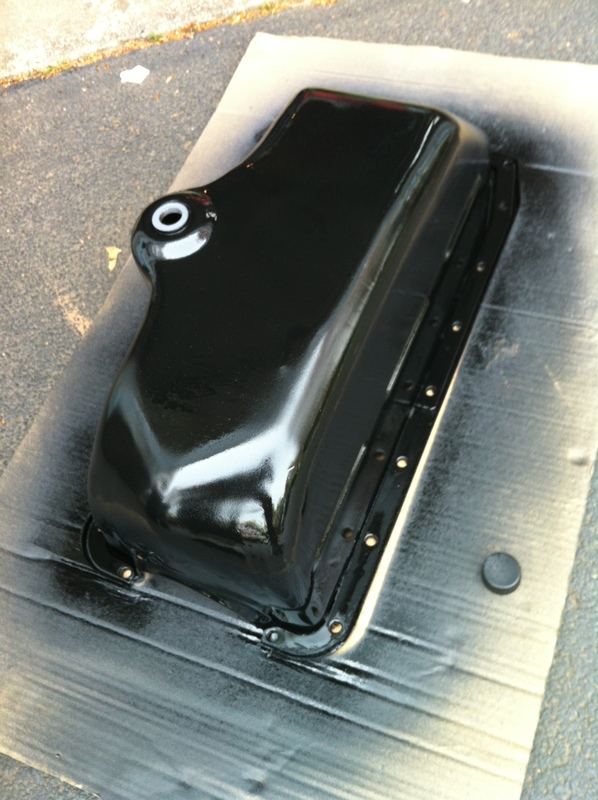 After HOURS of cleaning the pan, I dried it, primed it, and applied two coats of 500 degree black engine enamel. I probably don’t need the engine enamel, but I figured that this might get hot so I might as well use it. I painted only the part that faces the road. The inside is now shiny metal (with lots of spotting). 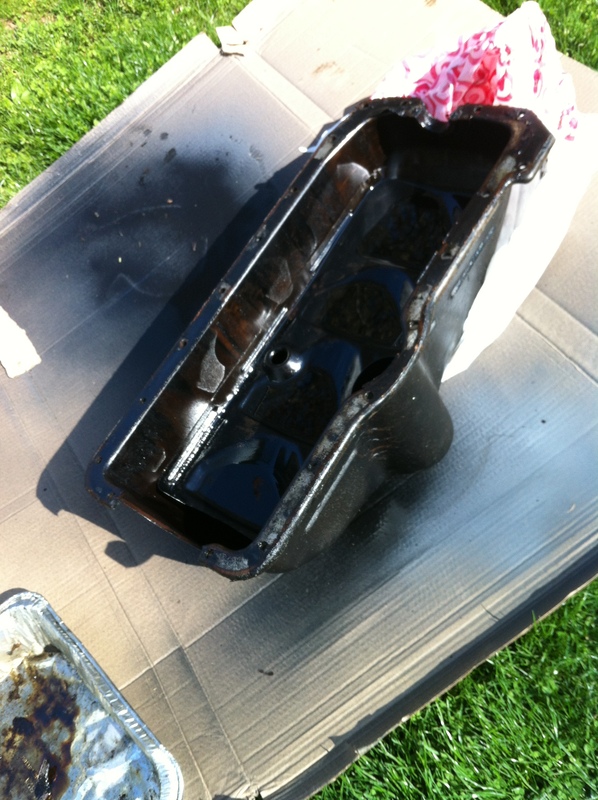 When I painted the pan, I removed the oil plug and put a bottle cap over the hole. I figure that you probably don’t want to get paint in this area. The pan is drying in the garage and should be fully cured by next week’s installation. The goal now is to order a few more parts — the gasket for the oil pump and the gasket for the valve cover. I was told that if I am dropping the pan, I should also clean the oil pump filter and clean the valve chamber. Both look like they will require gaskets that I didn’t order the other week. car jacked up and the underside of one of the side pans. The phaeton’s oil was drained overnight and I decided to use some of the daylight to aid in my “next step” on this project. So what did I get done? I started by putting the plug back into the oil pan and jacking up the front of the car and putting it on stands (so I could “work like a gentlemen”). The jack and stands I have only lift the car a few inches. The oil that came out was DARK. 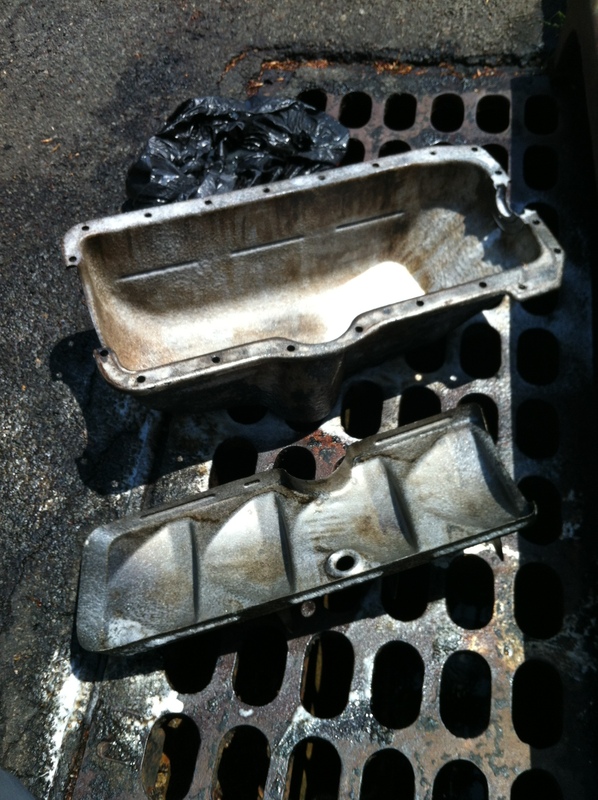 The little collecting dimple in the cap was very gritty and indicative of the gunk in the oil pan. You can’t remove the oil pan until you remove the side pans. Removing the bolts/nuts that hold the side pans onto the frame and the oil pan was supposed to be simple. It included a few surprises. First, the bolts all have cotter pins. This means I need to go buy some new cotter pins before I put the side pans back. The second was how much filth was built up on everything. The third was how difficult it was to remove the bolts/nuts. While I have long arms, I wasn’t able to reasonably reach the bolt head and the nut. After spending too much time stretching and slowly getting the first pan off, I finally decided to ask my mommy for help…. (I keep the car at my folks place. I live in Manhattan which isn’t really the type of place to keep this car and my folks had a space in the garage). Mom was a trooper and in about 2 minutes the second pan was down. With the pans off, I decided it would be wise to clean and prime them tonight. So I did. This included my scraping them clean, using brillo/SOS pads, using soap and water, attempting to fit them into the dishwasher (they don’t fit), using more soap and water, rinsing, sanding with emory paper, washing again, and then drying. The pans themselves aren’t in beautiful shape. 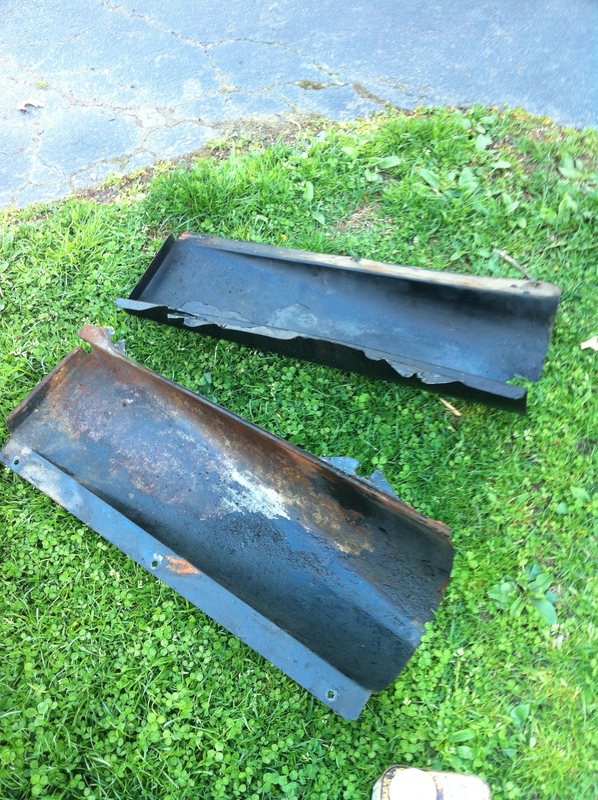 The pans have been beaten up over the years and the “bunny ears” that are used to connect them to the oil pan bolt were rusted out/shredded. move on. 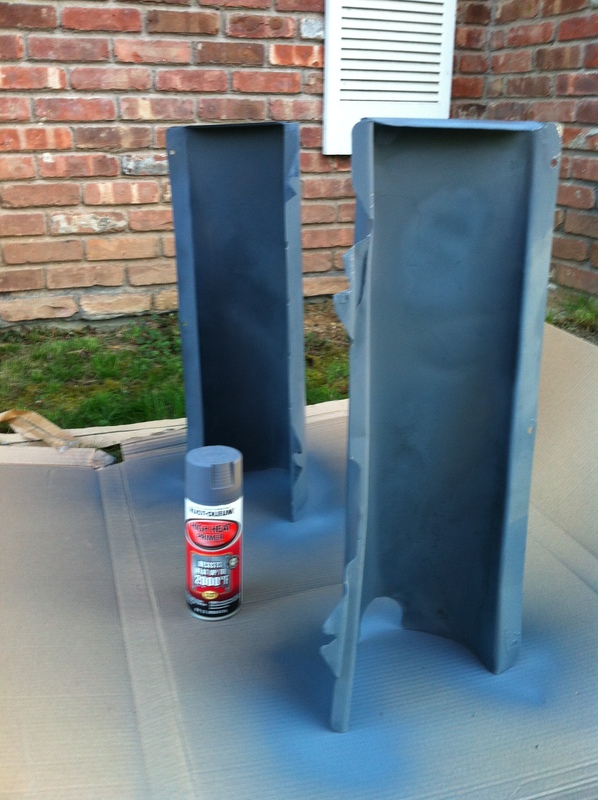 I then started to paint them with the primer I had in the garage and ran out. This was a good thing. 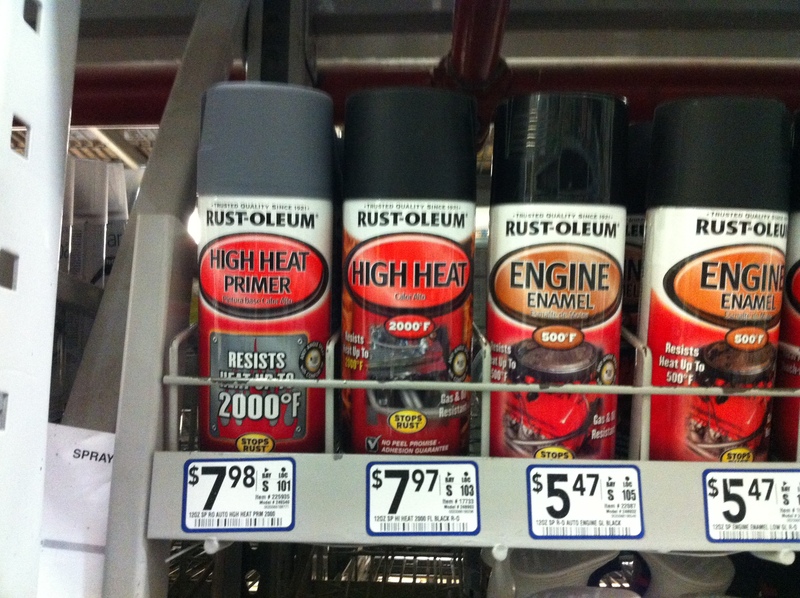 At Lowes, I found that there is a “high temp” primer and enamel paint that would likely be better. The pans probably don’t get too hot, but they are close to the engine and exhaust. I am not going to strip the pans again, but I am finishing the job with the high temp primer/paints which are fuel and oil resistant.Here is a little video as well. One of the first things you are told to do when you get a “new to you” Model A is to “drop the oil pan”, clean out the gunk, check bearing clearance, and do what needs to be done to protect the engine and crank shaft. When I purchased my Phaeton, I had no idea what this meant. Truth be told, I still don’t really understand it all. 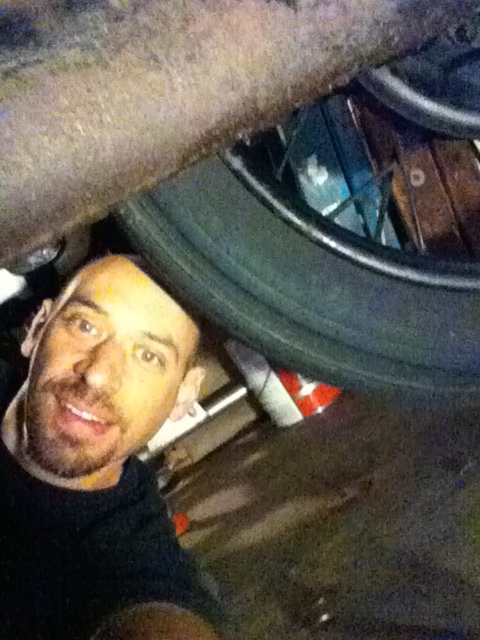 Sure, I can change the oil now… this isn’t a problem. Dropping a pan is a new concept to me but I am told it isn’t anything too difficult. As for bearing clearance, I always stay clear of bears so I am hoping that this isn’t a problem (John from J&M in Mass gave me some advice on this when I visited him the other month). With a big road trip to Ithaca NY planned for June, I figure that I really should remove what will likely be 40 years of gunk from the pan. You know, before the gunk clogs the entire engine and leaves me stranded on RT 17. 10) Add oil to the car and a beer to me. I have received a bunch of parts from A&M in Connecticut (and just realized that I probably also need the gaskets for the value cover and oil return pipe— DANG!). I’ve also printed out a bunch of “hints” from various Fordbarn.com posts. Here is a video of me draining the oil… it isn’t so exciting, but hey, I wish I could have watched someone do this before I did it my first time. I’m going to let the oil drain overnight in hopes that this results in less mess for me to clean later. The next few posts will follow me (and perhaps some of my friends) as we try to figure it all out. I’m going to try to document some of the highlights, but will STRONGLY SUGGEST that you don’t try to replicate my methods until we figure out if they work. The next post will likely show some of the parts I have for this project.